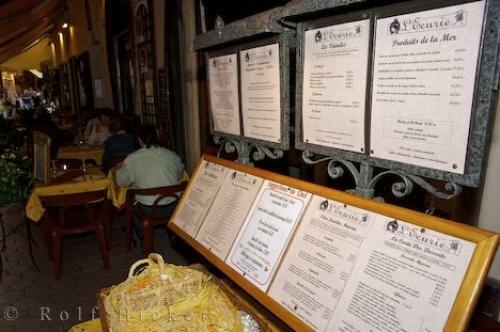 Menus adorn the wall of an Old Town Street Cafe in Nice, Provence in France, Europe. When visiting Nice in the Provence region of France there are so many sights to see, history to absorb, and Mediterranean cuisine to enjoy. The best place to find local food is at a street cafe in the Vieille Ville, or Old Town district of Nice in France.The Old Town has winding narrow streets and medieval buildings housing all kinds of interesting little shops where you can buy clothes, food and gifts. When hunger strikes stop at a street cafe to rest and enjoy a Provencal meal. Read the menu of the street cafe and choose from many interesting dishes - 'farcis nicois' local vegetables stuffed with breadcrumbs, 'socca' chickpea flour pancakes or any of fish soups. After a hearty meal, continue exploring the Old Town and enjoy the sight of Nice in Provence, France.Street Cafe in Old Town, Nice, Provence, Cote d'Azur, France, Europe. Photo of a street cafe in Old Town Nice, Provence in France, Europe.